Gene Kelly once said, “You dance love, and you dance joy, and you dance dreams. And I know if I can make you smile by jumping over a couple of couches or running through a rainstorm, then I’ll be very glad to be a song and dance man.” Gene Kelly certainly made people smile with his dancing, but fortunately you don’t have to be Gene Kelly to “shake your tail feathers”. Science has shown that there are plenty of reasons to hit a dance floor - besides being fun, it’s also good for your health. Dancing utilizes a variety of muscles including lower body, upper body and core. Keeping these muscles active and engaged over the years is a very important factor in aging well. A few weeks of dance class can help improve balance and coordination too, the lack of which can lead to stumbles and falls. Low-impact dance programs can also help reduce stiffness and joint pain. Dancing pumps blood to the heart, raises oxygen levels throughout the body and helps maintain strong, supple muscles, all of which can contribute to overall health. Like other forms of cardiovascular exercise, dancing can be beneficial for keeping high blood pressure under control, maintaining a healthy heart and reducing the effects of many health conditions such as type 2 diabetes. Many people struggle with self-confidence issues as they age and begin to experience a reduction in spatial awareness, balance and coordination. Dancing can impart a sense of accomplishment and is a natural mood-booster that may promote self-confidence and self-assurance when dancers experience that their bodies can still respond to music. The Albert Einstein College of Medicine in New York City conducted a 21-year dementia study of adults aged 75 and older. The study, which was published in the New England Journal of Medicine, showed that those adults who danced regularly has a 76% reduced risk for developing dementia compared to adults who regularly took part in other activities such as playing golf, bicycling, reading, etc. The study suggests that the combination of cardiovascular activity coupled with rapid decision-making may create new neural pathways, which in turn can help stave off dementia. Many older adults struggle with depression due to isolation or reduced activity. Dancing promotes social engagement, friendship and laughter and can help create a sense of belonging and meaning. Dancing can increase heart rate and oxygen levels, which can be a natural mood-lifter. In addition, studies have shown that aerobic activity like dancing can help reduce insomnia, anxiety, and stress levels significantly in older adults. One of the keys to aging well is having a life filled with activities that bring you joy. 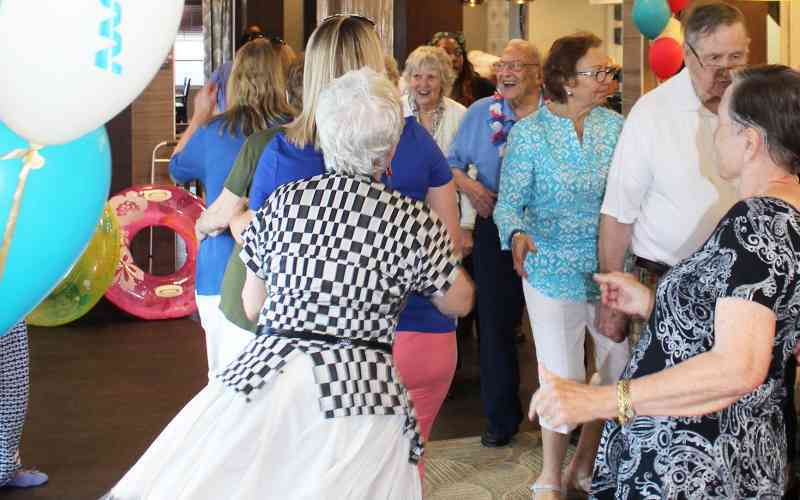 Daylesford Crossing offers a variety of social wellness programs to promote good health, help build connections and create fun. And at our social events, a dance party breaks out almost every time. Schedule a tour today to learn more about our various supportive care programs.